Prashanth Kamalakanthan writes on race, US foreign policy and political economy. He was a summer 2013 Nation intern and can be followed @pkinbrief. Did Racial Profiling Put an Unarmed Black Man in Jail in North Carolina? 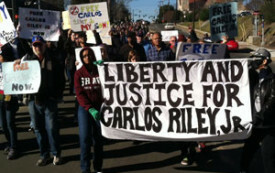 Activists in Durham, North Carolina, have come together in support of Carlos Riley Jr. and against the racial policing they believe has put him behind bars.